In this episode I talk about a couple re-dos of some older designs; review a couple books; discuss choosing patterns mindfully; teach you about lymph nodes for the At Home Pet Check; and update you on my progress on the health challenge. Lagniappe Mitts: Re-do of previous design for Knit Picks, worked in Capretta. 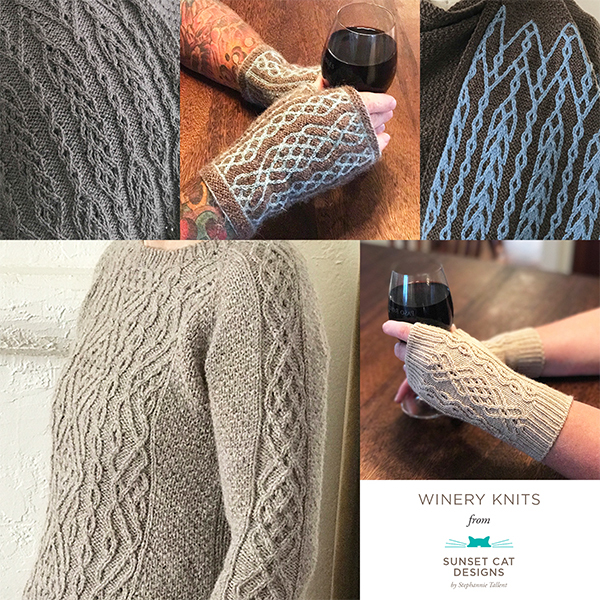 This version has directions for fingerless mitts with a ribbed cuff; the change in gauge allowed the addition of an additional size. If you’ve purchased Lagniappe in the past, you’ll be getting this version as well — look for the Rav pm when it’s published. Josephine Mitts: Also a re-do for Knit Picks, worked in Galileo, more extensive than the re-do for Lagniappe. This really ends up as a different pattern than the orginal Josephine and will be getting its own pattern entry on Ravelry. Yarn is with the sample knitter for the second mitt. I expect to do the photoshoot for the above mitts in mid May. The Fibre Company: Sweater still in progress. On the sleeves! Tangaroa by The Madeira on Double Crown Records.